Want to check your Voter complete information online? Yes, now you can search your name in electoral roll (Voter list) online. You can view your complete voter information like your polling station, your Voter card number, part number, Assembly Constituency, Part Name, and Serial Number. Election commission of India has launched the voter service portal to check voter details and add your name in the electoral list. Step 2: Now search your name. Select “Search by Details” and enter your name, Date of birth, gender, state, district, and assembly constituency. Enter captcha code and click on search. If all details entered by you are correct then you can see your name in search results. Click on View Details. Step 3: Next screen you can see your complete voter information. Your EPIC number, part number, part name, polling station, serial number etc. You can also add your name in voter list after the age of 18 years. Visit https://nvsp.in and fill form number 6. You will get your Voter ID card at home after approval your details. 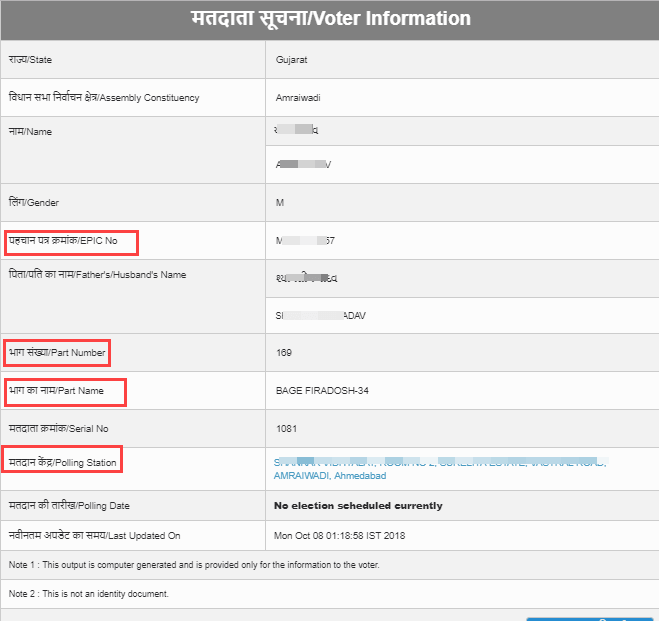 So this is how to check your name in Voter list and view complete voter information online like polling station, part number, part name, and serial number.